A home’s appeal isn’t just about the way its structure looks like but the landscaping also has a huge impact on a home’s curb appeal. Well, imagine a beautiful house with no plants or stones around it. Just plain soil. It looks dull, right? That is why it is important to add a beautiful landscape to a home. We have seen many homes with lovely landscapes and we cannot deny its amazing impact to the house. 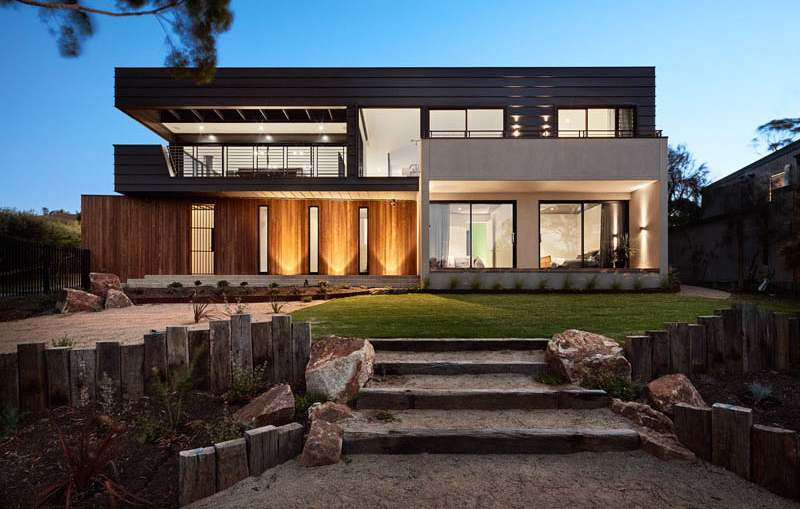 Today, we are going to show you a modern house in Australia which has a striking geometric design. 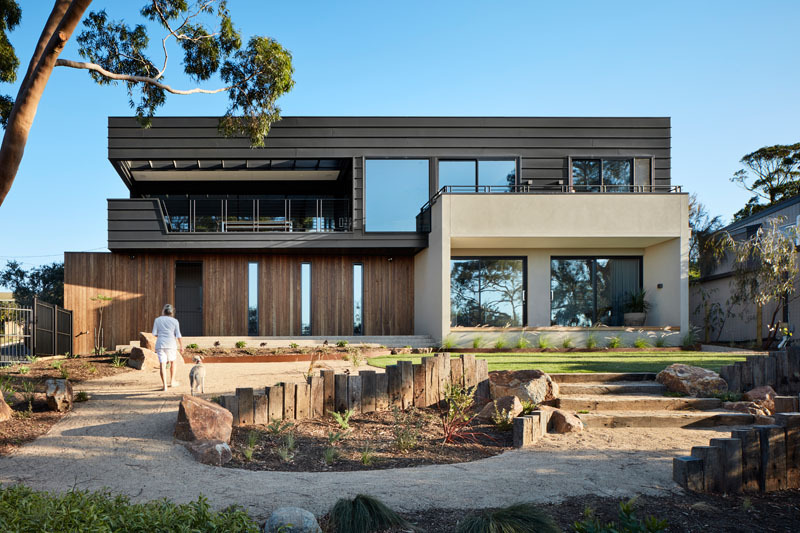 One goal of the homeowners is to create a connection between the house and the landscape. Unique feature: A modern house with a sleek design which connects with the landscaping outside. 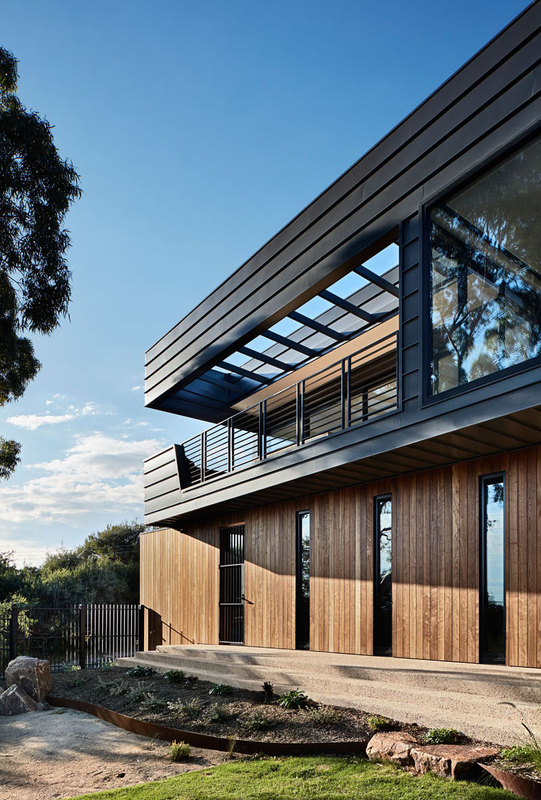 The homeowners wanted a new house on a bayside site with views across Port Phillip Bay to the city. The building is contained to one edge of the site in order to maintain a strong connection with the existing landscape. Aside from that, the owners also want the house to take advantage of the long-distance views. 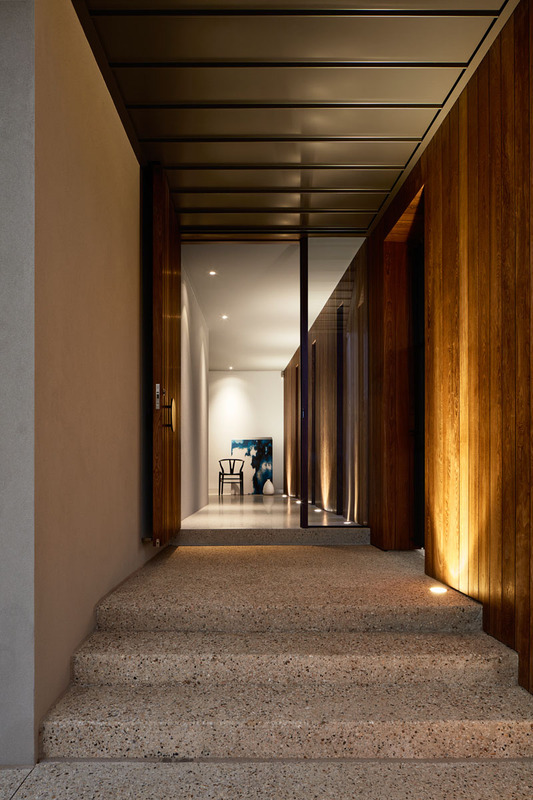 The materials used in the house are simple, clean and robust. It is designed to engage with the landscape as it grows and defines the property. 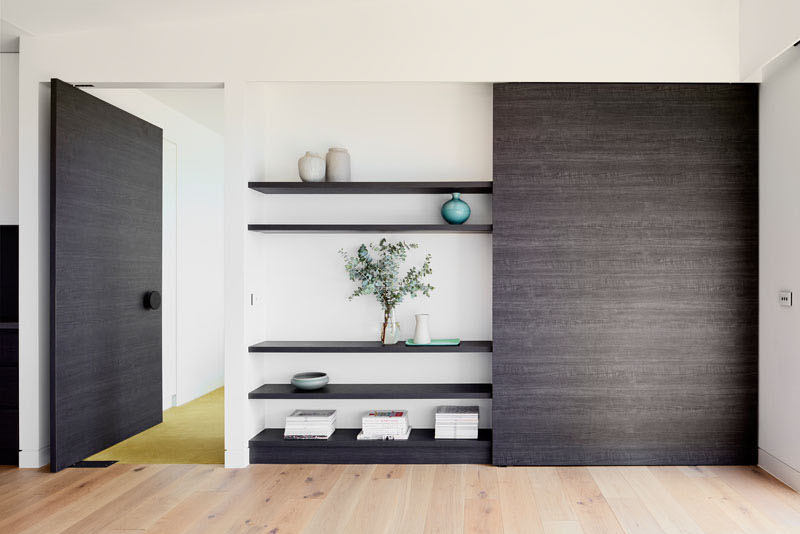 The entryway is tucked behind a timber-clad wall with vertical slot windows. 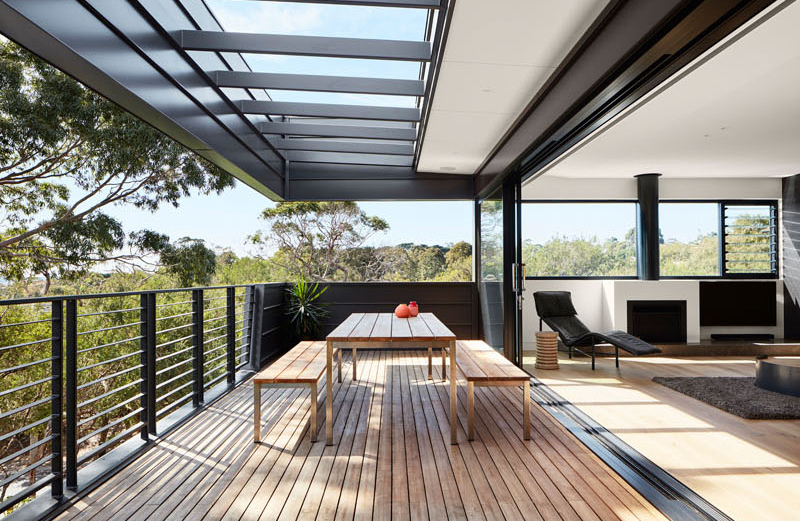 These windows frame the views of the garden and add appeal to it. 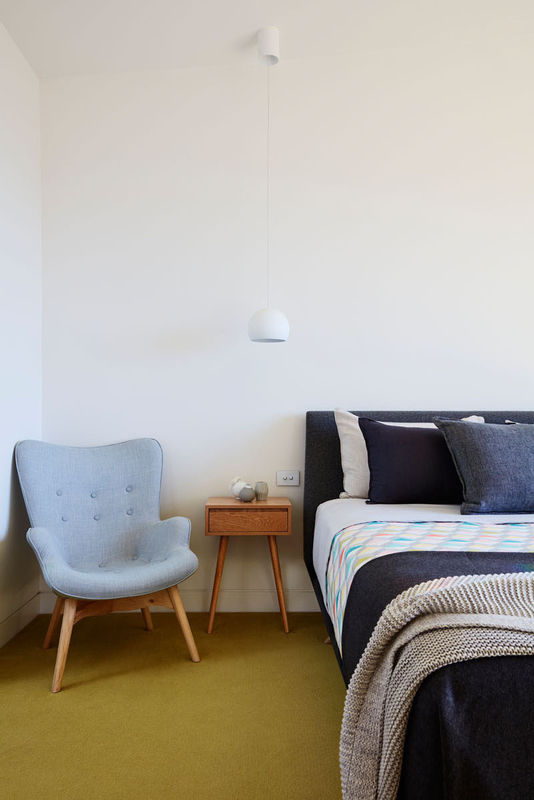 A sophisticated weekender, the first floor living reflects the client’s love of food, wine and entertaining. 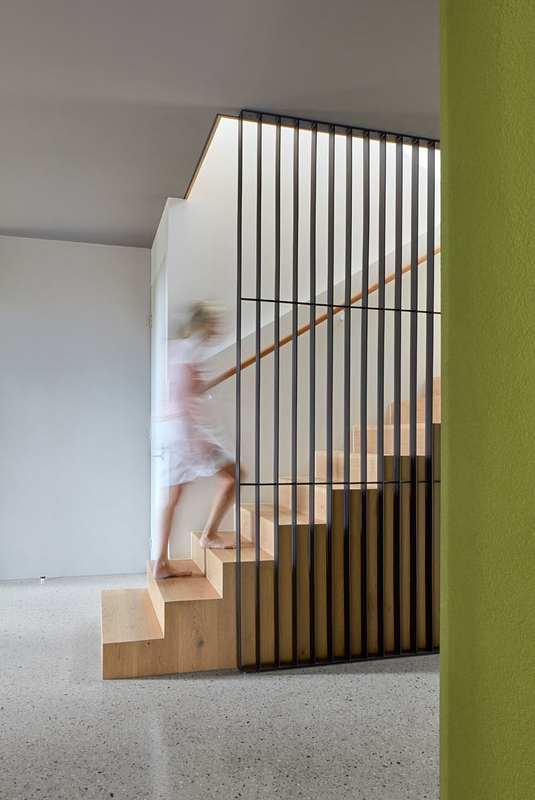 The lower floor is internalized – the muted color palette punctuated by a punch of green identifying the cellar which forms the core of the house. This is the dining area of the house with white kitchen cabinets and a wooden dining table. 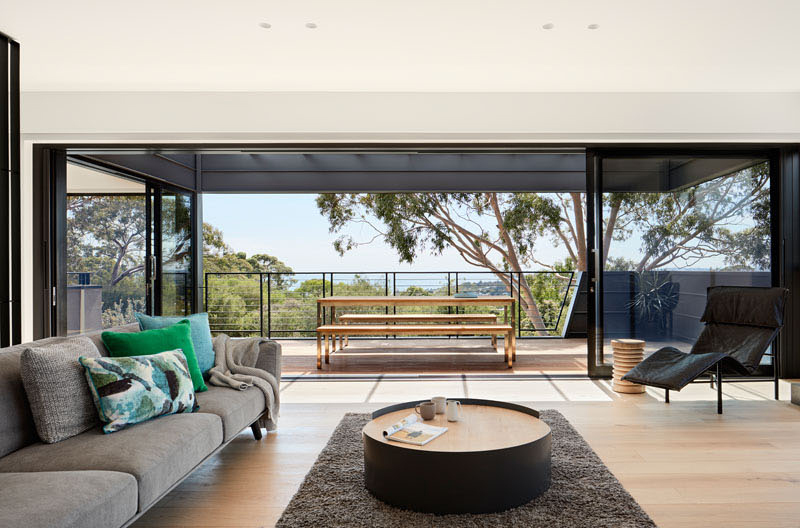 It has a floor-to-ceiling window that provide views of the area around it. 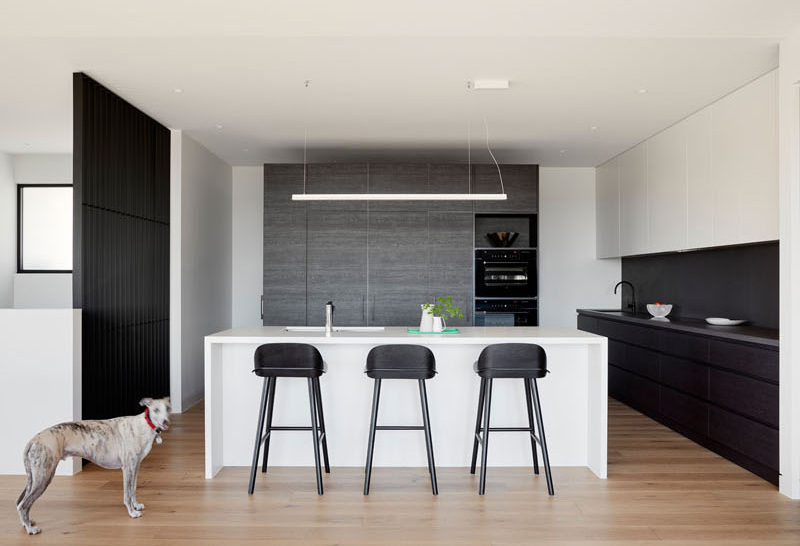 The kitchen has a large white island, while dark cabinetry compliments the other dark elements like the dining chairs, counter stools and shelving. 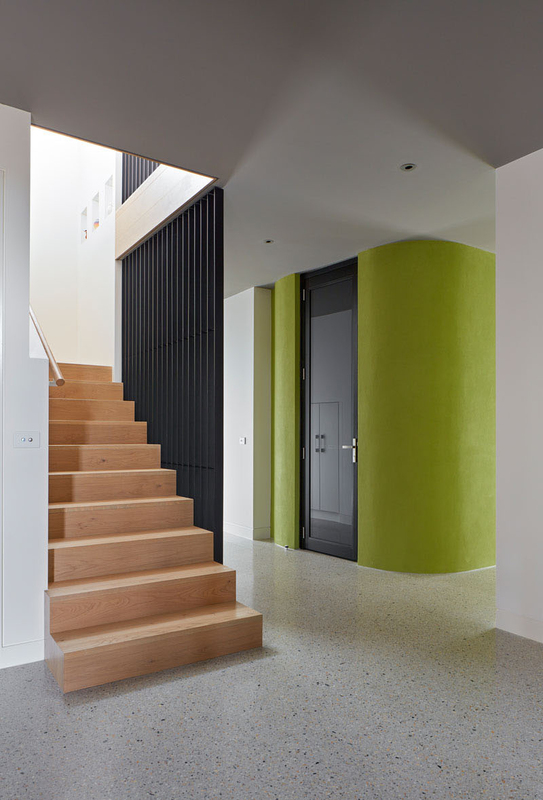 Inside, polished-concrete screed floors and charcoal colored ceilings create a contemporary appearance, while a lime green rendered cellar adds a pop of color. Light wood stairs lead up to the second floor of the home. This color is echoed in the first floor carpet as part of a lighter, airier assembly of materials and colors. Just off the kitchen and almost hidden within the shelving and kitchen cabinetry is the door to the master bedroom. Green flooring has been used again as a color element in the mostly white interior. The bathroom is also white with simple modern fixtures in it. It has a long rectangular mirror on the wall which makes it visually larger. 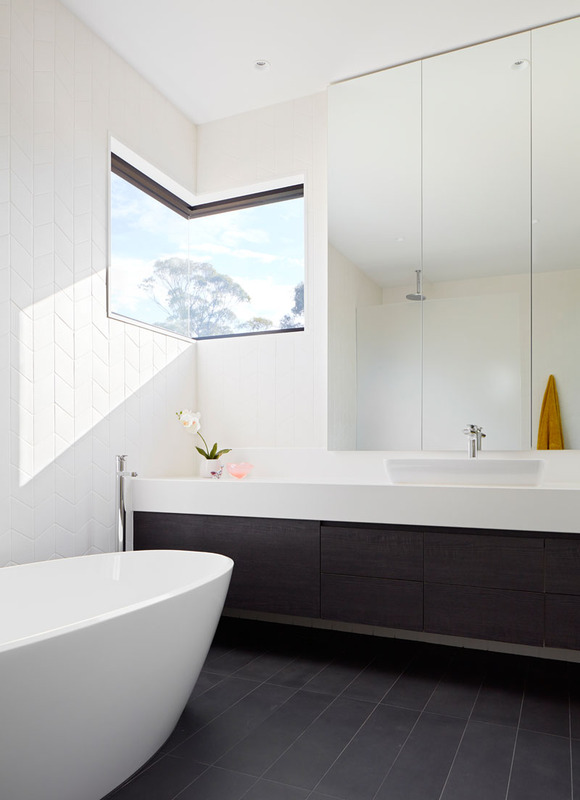 In the en-suite bathroom, a corner window adds natural light and provides a view of the trees, while dark flooring and a dark vanity contrast the white bathtub and white floor-to-ceiling tiles. 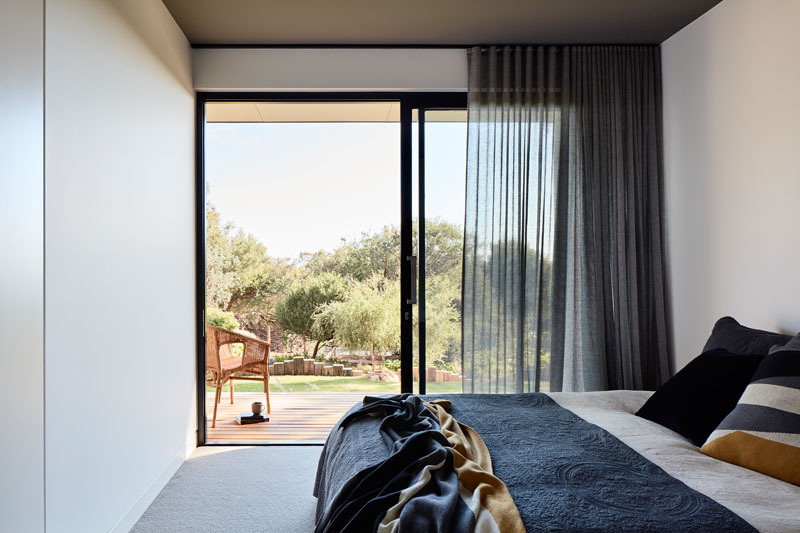 In another bedroom, a sliding glass door can be opened to have direct access to the backyard. 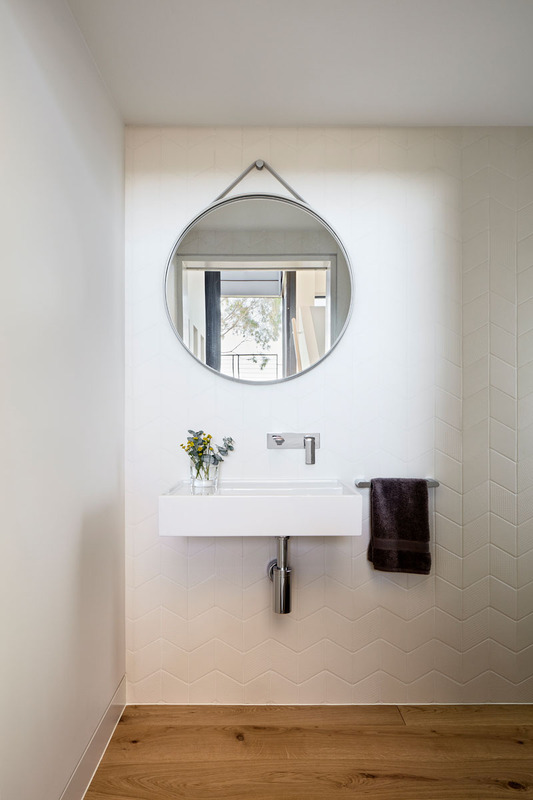 In this bathroom, a round mirror hangs on the wall, while white tiles in a chevron pattern cover the wall. Upstairs is an open floor plan with an outdoor living room. It is located off the indoor living area which has large sliding glass doors that open the space up to the balcony. Let us take another look at the home’s facade. This looks even more beautiful during the night when the outdoor space and the interior are lighted. The house is designed by Bryant Alsop and with the looks of it, they really did a great job with its layout and architecture. Of course, the interior is very nice too. Another thing that made the house beautiful is its mix of materials as well as the landscaping. You have also seen how it looks like during the night when the lights are turned on. 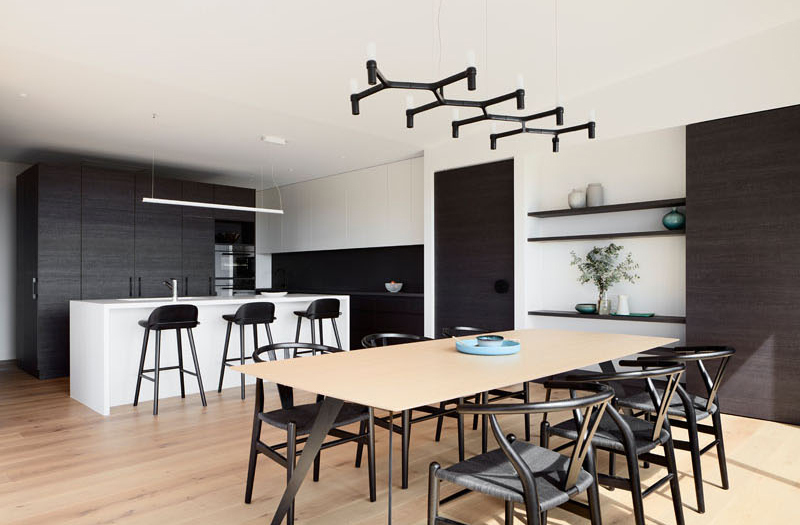 The house used a lovely mix of textures, shapes, and lines which resulted in a simple yet sophisticated modern home. Would you love to have a house similar to this?